Most people work outside of their homes for at least eight hours, five days per week. During the time we are at work, we have no idea what is happening at our homes. Thieves could ransack our rooms, our children could host wild parties, our significant others could parade around the house singing Britney Spears songs into a hair brush, and we would be completely oblivious. Thanks to networked Web cams and free services like Sensr.net, we never have to miss another event that happens in our homes while we are away. Assuming you already have a wireless home network, the first thing you need to set up home monitoring is a network-capable Web cam. Our built-in Web cams would not work with Sensr.net—at least without a good amount of work. 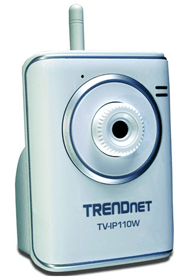 Look for a wireless-style Web cam with either a rechargeable battery or a wall plug. These range from around $60 all the way to several hundred dollars. The TrendNet camera pictured below retails for $66 on Amazon. Follow the direction in the box for installing the camera to your home network. A networked Web cam will come packaged with administrative software—you will need this to connect with Sensr. Now, open a browser and navigate to Sensr.net. Click the green Add Your Camera button. 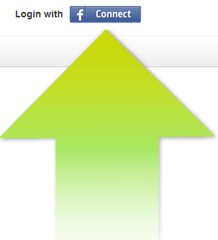 Click the Facebook Connect button at the top of the page to create a Sensr account. You will be prompted to allow the service access to your Facebook information. On the next page, click Add a Camera. 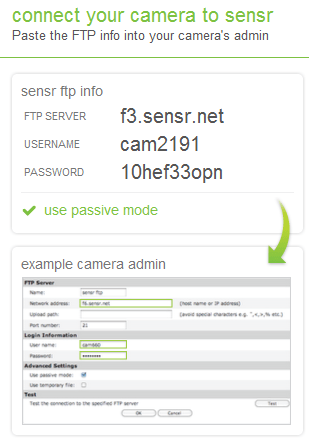 The next page displays the FTP information you need to set your camera to send images to Sensr. Open your camera’s admin program, and find the FTP settings. Enter the settings displayed by Sensr. Your camera will then display images in the box on the far right. You can watch these images from any computer, anywhere—just log in at Sensr.net. By default, your Facebook friends can also see the camera’s live feed. To turn this off, click the drop-down menu under Who Can See This Camera? and choose Only Me. If you do not mind a bit of extra configuration and want to use your computer’s built-in Web cam, try installing Fwink. While it does not work with every Web cam, it does work with most modern cameras—and Sensr, too. Overall, we love the idea of installing a cheap surveillance system in the way Sensr allows. After just a few minutes of configuration, we were able to check our Web cams from the grocery store using only a smart phone. This is truly technology at its best.